The Malankara Syrian Orthodox Theological Seminary is established as a Pontifical Institution under the supreme authority of the Patriarch of Antioch and all the East of the Universal Syrian Orthodox Church. The Seminary is managed by His Beatitude the Catholicose and the Holy Episcopal Synod of the Jacobite Syrian Church and by H.G. 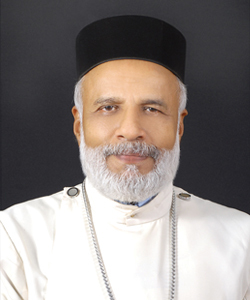 Dr. Kuriakose Mor Theophilose – the Metropolitan appointed for the affairs of the seminary. It was the great ambition of late lamented Catholicose H.B. Mor Baselios Paulose II to establish a new Seminary for the church and in 1985 His Beatitude entrusted me to realize this ambition and by the Grace of god it was realized within five years. On 1st January 1990 classes began in the new Seminary complex and our joy was double because it was a great challenge to establish a Seminary in the midst of the crucial problems and split in the church and severe financial crisis. Let me praise God Almighty for his abundant blessings and let me also express my hearty thanks to all those who have rendered their services in establishing the seminary. Among them the name of late lamented Arch bishop His Eminence Mor Julios Yesu Cicek can never be forgotten. During the past years God has been guiding the institution through the path of excellence. Our Seminary has been successful in moulding many bishops, priests, deacons and nuns who are rendering their valuable services in various parts of the world. Along with the imparting of academic knowledge the seminary life gives utmost importance to the personal and vocational formation of the seminarians, to enable them to be the anointed ones of Lord Jesus Christ. Along with this prime responsibility, the seminary also takes initiatives in giving orientation and leadership in various educational, religious and social avenues which are rooted in social welfare. Today when the seminary is advancing in pursuit of excellence, we heartily commemorate our great spiritual leaders who enlightened the institution with their wisdom and guidance.